There are millions of people who bounce from one diet to another, unable to keep off the weight. What they do not know is that there are hidden reasons for yo-yo dieting, compromising health for food, feelings of a broken spirit, or seeking comfort in food. 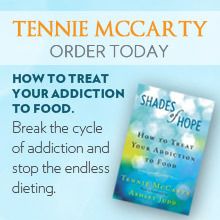 Recovery Online will help uncover these unhealthy attractions to food or relationships by offering real-life solutions through a step-by-step program that teaches you how to let go of the pain and the never ending cycle of diets, binges, negative behaviors and broken promises until you are finally able to find the one thing we all ultimately crave - peace within.